Do you know an easy way to get your kids excited about math? Get out the LEGO bucket and try some LEGO math games! LEGO Bricks are so versatile and can be used to illustrate many different math concepts. You can use them for counting, preschool math, and all through elementary school. 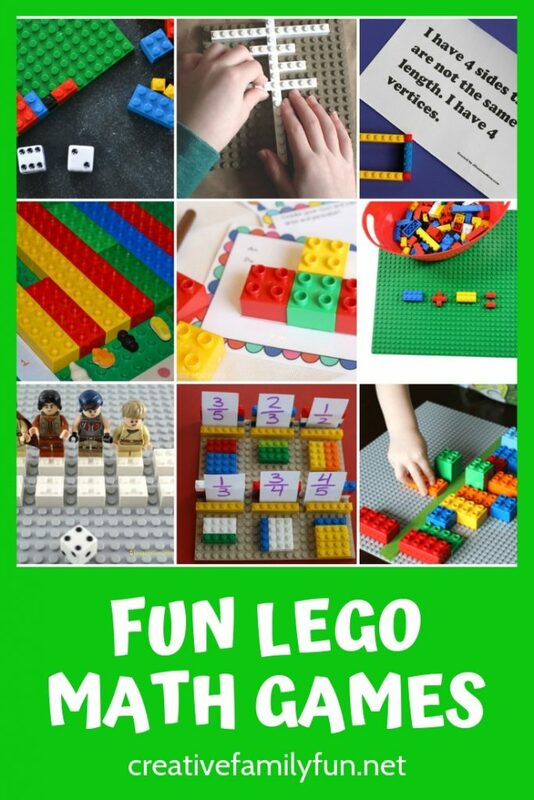 Check out these great LEGO math activities. Make simple bar graphs with LEGOs with this fun Ocean Animal Graphing Activity from JDaniel4’s Mom. Use LEGOs to practice patterning with this simple idea from Hands On As We Grow. Teach symmetry to preschoolers using LEGO bricks with this idea from Fun Learning for Kids. Complete this simple LEGO math challenge from Buggy & Buddy. This activity is fun for all ages of kids. Use LEGOs to experiment with nonstandard measurement with this idea from Days with Grey. Practice counting with these ocean-themed LEGO counting mats from JDaniel4’s Mom. Practice addition with our simple Pick Two LEGO Math Game. How many LEGOs does it take to fill a base plate? Use your addition skills when you try our fun addition challenge. Use LEGOs and these free printables to add up to 20 with this fun idea from 3 Dinosaurs. Practice skip counting with LEGOs with this simple idea from Powerful Mothering. Use LEGOs to help you “see” fractions with this fun fraction activity from JDaniel4’s Mom. Set up a fun LEGO math busy bag with the help of these challenges from Little Bins for Little Hands. Use LEGOs to learn all about bar charts with this fun idea from Science Sparks. Explore area and perimeter using LEGOs with this fun idea from Schooltime Snippets. Solve these geometry riddles with the help of your LEGOs when you try this activity from JDaniel4’s Mom. Illustrate the concept of multiplication with this idea from School Time Snippets. Use your minifigs to practice addition and subtraction with this fun game from Inspiration Laboratories. Explore open and closed polygon shapes with this geometry activity from JDaniel4’s Mom. Use LEGOs to explore the symmetry of snowflakes with this fun idea from Rainy Day Mum. Practice making ten with your LEGOs and minifigures with this idea from Inspiration Laboratories. Illustrate the Pythagorean Theorem using LEGOs with this idea from iGame Mom. Make a 3-D LEGO multiplication graph with this great idea from Frugal Fun for Boys and Girls. 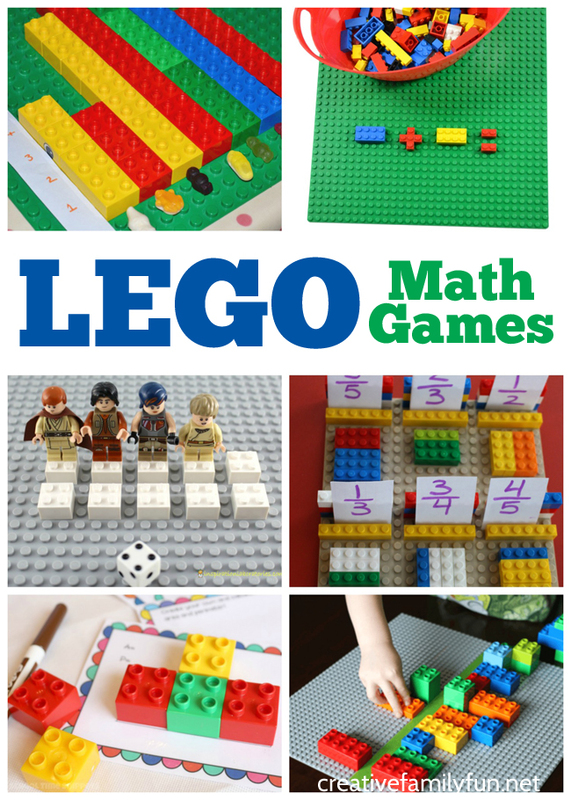 Which of these fun LEGO math games are your going to try with your kids? LEGO sets are awesome, but a general collection of LEGOs are perfect for learning activities and other fun. Here are some great resources to keep on hand.